S. and I were engaged and just bought our first home together… a quiet condo nestled in green trees. It was brand new. We picked the decor, signed our first mortgage, and made that little place our own. It was small (2 bedrooms, 2 baths, probably about 1,000 sq. ft.) but it was ours. S. moved in in October of 1994, we married in February 1995, and I arrived with my cat Luke to start our life. 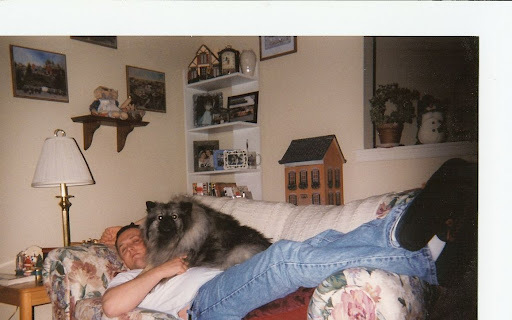 We welcomed our first and only dog, Teddi that same year, and the four of us lived comfortably until we built our present home in 2000. We sold our beloved condo to my brother-in-law, and he sold it a couple years later as well. Lord knows how many people have moved in since, but HOW FUNNY was it when I spotted an ad in the paper last weekend…. it is for sale again! How funny to find it again! It must’ve been a blast from the past.